I had lunch with another designer friend on Friday. We were talking about sales, the international nature of the knitting business and how social media plays into all of the above. I think I'm seeing something new. I've noticed many of my patterns seem to find an audience long after publication. I know many industry insiders who are all about the release. They try to manipulate the "hot right now" in Ravelry, they only advertise new patterns and they avoid publishing close to the dates the well known online magazines publish. I've never seen one of my patterns on "hot right now". I have occasionally gotten an email saying I was there but clearly it was for such a short time I didn't look quick enough. I think in some way sites like Ravelry, Patternfish and Love Knitting may be changing the world of knitting patterns. Buyers don't really care when a pattern was published, they want a pattern which meets their needs. Once they get past the early pages and do a search on the parameters they are looking for they see older patterns and often don't even know when the pattern was published. What I'm seeing is patterns like this one starting to sell more months after it was published than it did at the time of release. I've had the impression that publishers were in partnership with yarn companies, so that it's more about selling yarn than selling patterns. Just one person's observation, fwif. Hi Robin, I've noticed a big change in the last couple of years of customer reaction on Ravelry. It used to be when I published a design there would be a surge of sales (and occasionally I'd end up on the hot right now list). But now there is hardly any reaction and low sales. Patterns seem to sell most 2-3 years after publishing, probably after a few projects have been posted to Ravelry. I'm glad to hear I'm not the only getting little reaction on release. I'm also hearing commentary on low project numbers being a limitation but that ends up being a self fulfilling prophecy. The vest at the top of the page is a best seller on the Patternfish list every year, but I see very few project pages for it. I've noticed that, too. Also, people like me that don't have a ton of time to knit wind up making things like Clapotis many years after publication. 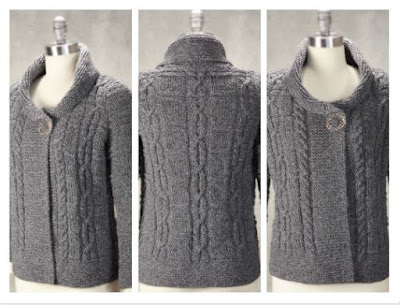 And then there are designs that I've done that are just sitting in Ravelry, no love....no projects....except mine, of course (because I make prototypes of anything I design because I'm crazy that way). And then, someday, someone makes something and woo!